This split features two doomy bands, the first being Noctu from Italy. Noctu happens to be the sole member and also plays in Atra Mors and Necromist. After a full length, this is the first record with an English title by the funeral doom project from Crema. The slow, dirge-like doom by the Italian artist has a certain cinematic quality and minimalism to it. Only lurching forward with an ever lumbering pace, the vocals are muddled into the mix where they hardly seem to really convey any meaning anymore. On ‘Lacerazioni Tra Le Ombre’, they merely appear as abyssal murmurings, rumbling in the distant haze of the sound. With a long intro and outro to his part of the record, Noctu demonstrates a knack for dense atmospheres and troubling ambient. Strangely enough, Auga Sigyn immediately hits you with a sort of crusty doom sound. 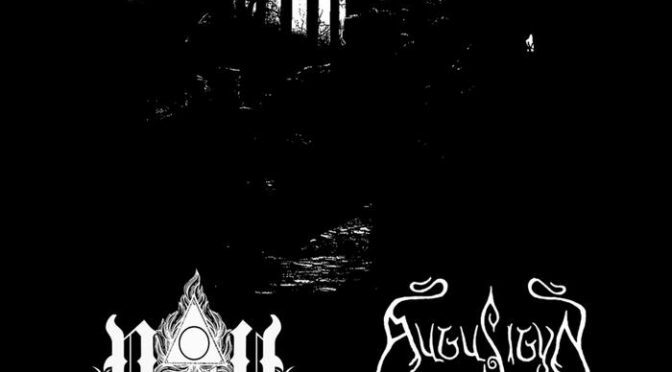 The Danish act from Svendborg has released some EP’s before, mostly in the native language too and now the duo, also active in Djævles Skrig, Blackhorned, Grimnismál and a gazillion other projects, participates in this split. Instantly noticeable are the vocals by Sarah Lee Berthelsen, who bars and howls as if possessed on ‘Antropomorfisk Form’. it’s unnerving, resounding clearly over the distorted, warped guitar sound of their primitive pitch-black doom metal. The harrowing sound of the Danish duo is definitely for the sensitive souls, particularly on ‘Den Hængte Mands Bøg’ the sound is quite derailed and maddening even. Rabid barks and an almost ritualistic drumming is accompanied by piping guitar tunes. It helps to bring the record to its creepy ending.